3 UNIQUE MODES FOR THE ULTIMATE ENTERTAINMENT PACKAGE. Epic Single-Player, acclaimed Multiplayer and 4-Player Co-Op Zombies. 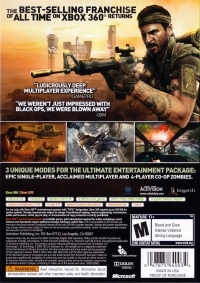 03-02-2016 lugnut Box Text The BEST-SELLING FRANCHISE of ALL TIME on XBOX 360 returns "Ludicrously Deep Multiplayer Experience" - Gamepro "We Weren't Just Impressed With Black Ops, We Were Blown Away" - OXM 3 UNIQUE MODES FOR THE ULTIMATE ENTERTAINMENT PACKAGE. Epic Single-Player, acclaimed Multiplayer and 4-Player Co-Op Zombies. 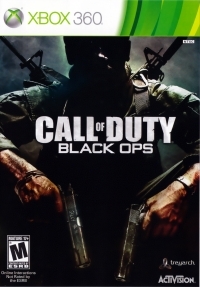 This is a list of VGCollect users who have Call of Duty: Black Ops in their Collection. 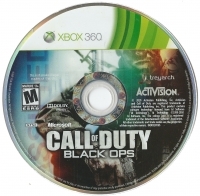 This is a list of VGCollect users who have Call of Duty: Black Ops in their Sell List. This is a list of VGCollect users who have Call of Duty: Black Ops in their Wish List.